Not to be confused with West, Texas. There is no consensus on the boundary between East Texas and West Texas. While most Texans understand these terms, no boundaries are officially recognized and any two individuals are likely to describe the boundaries of these regions differently. Walter Prescott Webb, the American historian and geographer, suggested that the 98th meridian separates East and West Texas; Texas writer A.C. Greene proposed that West Texas extends west of the Brazos River. West Texas is often subdivided according to distinct physiographic features. The portion of West Texas that lies west of the Pecos River is often referred to as "Far West Texas" or the "Trans-Pecos", a term first introduced in 1887 by Texas geologist Robert T. Hill. The Trans-Pecos lies within the Chihuahuan Desert, the most arid portion of the state. Another part of West Texas is the Llano Estacado, a vast region of high, level plains extending into Eastern New Mexico and the Texas Panhandle. To the east of the Llano Estacado lies the “redbed country” of the Rolling Plains and to the south of the Llano Estacado lies the Edwards Plateau. The Rolling Plains and the Edwards Plateau subregions act as transitional zones between eastern and western Texas. The counties included in the West Texas region vary depending on the organization. The Texas Counties.net website acknowledges the variations, and includes 70 counties in its definition, based on the five principal metropolitan areas it contains: El Paso, Lubbock, Abilene, Midland/Odessa, and San Angelo. The counties included are Andrews, Bailey, Borden, Brewster, Brown, Callahan, Castro, Cochran, Coke, Coleman, Comanche, Concho, Crane, Crockett, Crosby, Culberson, Dawson, Deaf Smith, Dickens, Eastland, Ector, El Paso, Fisher, Floyd, Gaines, Garza, Glasscock, Hale, Haskell, Hockley, Howard, Hudspeth, Irion, Jeff Davis, Jones, Kent, Kimble, King, Knox, Lamb, Loving, Lubbock, Lynn, Martin, Mason, McCulloch, Menard, Midland, Mitchell, Motley, Nolan, Parmer, Potter, Pecos, Presidio, Randall, Reagan, Reeves, Runnels, Schleicher, Scurry, Shackelford, Stephens, Sterling, Stonewall, Sutton, Taylor, Terrell, Terry, Throckmorton, Tom Green, Upton, Val Verde, Ward, Winkler and Yoakum. Some of the smaller West Texas cities and towns include: Alpine, Andrews, Anthony, Brownfield, Canutillo, Canyon, Crane, Fort Davis, Fabens, Fort Bliss, San Elizario, Fort Stockton, Hale Center, Iraan, Kermit, Lamesa, Levelland, Littlefield, Marathon, Marfa, McCamey, Mertzon, Monahans, Ozona, Pampa, Pecos, Horizon City, Post, Rankin, Seminole, Slaton, Snyder, Sweetwater, and Van Horn. West Texas receives much less rainfall than the rest of Texas and has an arid or semiarid climate, requiring most of its scant agriculture to be heavily dependent on irrigation. This irrigation, and water taken out farther north for the needs of El Paso and Juarez, Mexico, has reduced the once mighty Rio Grande to a stream in some places, even dry at times. 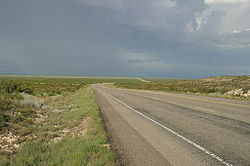 Much of West Texas has rugged terrain, including many small mountain ranges while there are none in other parts of the state. Except for the Trans-Pecos region, West Texas has become well known as a stronghold for conservative politics. Some of the most heavily Republican counties in the United States are located in the region. Former U.S. President George W. Bush spent most of his childhood in West Texas. 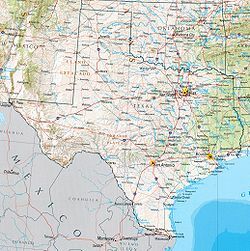 The Panhandle and several counties in or west of Midland were one of the first areas of Texas to abandon the state’s “Solid South” Democratic roots; nine counties[a] have not supported a Democrat for president since 1948. The Rolling Plains to the east remained Democratic for substantially longer: even Walter Mondale in 1984 when losing Texas by 27.50 percentage points carried five counties in this region. [b] However, since 2000 this region has swung very rapidly towards the Republican Party due to its population’s intransigent opposition to the liberal social policies of the Democratic Party and by 2016 has become nearly so Republican as the Panhandle. Major industries include livestock, petroleum and natural gas production, textiles such as cotton, grain, and, because of very large military installations such as Fort Bliss, the defense industry. West Texas has become notable for its numerous wind turbines producing clean, alternative electricity. As of 2018, the West Texan economy is in an economic period, which has been described as the "West Texas oil boom". Pumpjacks, like this one south of Midland, are a common sight in West Texas oil fields. The Brazos Wind Farm near Fluvanna is one of many wind farms in West Texas. West Texas does not have major league sports teams. Instead the region has college teams such as Texas Tech Red Raiders and UTEP Miners, which play in NCAA Division I, and NCAA Division II teams of the West Texas A&M Buffaloes, the Texas–Permian Basin Falcons, and the Lubbock Christian Chaparrals and Lady Chaps. El Paso also hosts the El Paso Chihuahuas, a AAA baseball team and Midland hosts the Midland RockHounds, a Double-A baseball team. Oddly in the heat ravaged climate of West Texas, the winter sport of ice hockey can be found in the city of Odessa through a Tier II junior ice hockey team playing out of the North American Hockey League (NAHL) called the Odessa Jackalopes. In 2019, The San Antonio Missions will move to Amarillo and continue play at the Double-A level; a mascot and team name have yet to be announced. "West of the Pecos" has become a metaphor for the universe of westerns. "Fastest draw west of the Pecos" and similar superlatives are a cliche, and the title character of Chisum observed ”There’s no law west of Dodge, and no God west of the Pecos”. See West of the Pecos (disambiguation). ^ Cochran, M., Lumpkin, J. and Heflin, R. 1999. West Texas: a portrait of its people and their raw and wondrous land. Lubbock: Texas Tech University Press, 176 pp. ^ Webb, W.P. 1935. The Texas Rangers: a century of frontier defense. New York: Houghton Mifflin Co., 583 pp. ^ Hill, R.T. 1887. The topography and geology of the Cross Timbers and surrounding regions in Northern Texas. The American Journal of Science, 3rd Series, 33:291–303. ^ "The Regions of Texas". Texas Counties.net. Retrieved 13 October 2014. ^ Clifford, Krauss (March 28, 2018). "$9.5 Billion Purchase by Concho Is Latest Sign of West Texas Oil Boom". New York Times. Retrieved May 15, 2018. ^ Saphir, Ann (May 1, 2018). "Boom in West Texas oil patch lifts wages, prices". Reuters. Retrieved May 15, 2018. ^ West Texas counties voting Republican at every election since 1952 comprise Ector County, Gray County, Hansford County, Hutchinson County, Lipscomb County, Midland County, Ochiltree County, Randall County and Roberts County. ^ West Texas Plains “Bible Belt“ counties voting for Mondale in 1984 were Cottle County (which was in fact one of 130 counties nationwide to vote for George McGovern in 1972), Dickens County, Fisher County, Stonewall County and Swisher County. This page was last edited on 11 April 2019, at 23:28 (UTC).